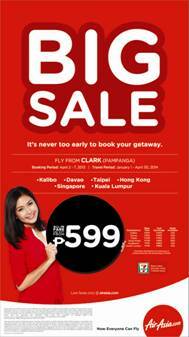 AirAsia Philippines’ big seat sale is back! Book your trips for 2014 now and enjoy early bird savings through Philippines’ AirAsia’s big seat sale promo starting today (April 2). All-in promo fares from as low as P599 only for international and domestic destinations are available for booking via www.airasia.com from 2 to 7 April 2013, and the travel period will be from 1 January to 30 April 2014. “AirAsia continues to change the landscape of low-cost travel. With our big sale promo, planning a trip is easiest with our all-in fares and rates clearly laid out for our guests, so grab those promo seats now and enjoy huge savings,” Freddy Herrera, AirAsia Inc. Commercial Head, said. For payment convenience, AirAsia’s payment partner service provides guest the option to pay for promo seats booked online in cash through any 7-Eleven and Bayad Center outlets nationwide. “AirAsia believes in providing convenient service to make traveling easier and more affordable for our guests. In the coming weeks, we are expanding our cash payment partner service to include Cebuana Lhuillier and other popular outlets and banks so that more and more people will have access to our promo fares and bargain deals,” Herrera added. The promotional seats are also available for booking via AirAsia’s mobile booking platforms through WAP enabled phones at mobile.airasia.com and AirAsia apps on iPhone and Android devices. Philippines’ AirAsia call center also accepts booking of regular fares via +632 742.27.47 from Monday to Sunday at 0800hrs to 2100hrs. “There are exciting summer vacation activities and places close to home and around Asean cities waiting to be discovered. With our big sale promo and AirAsia’s awesome network of 186 routes with 85 destinations throughout 18 countries, you get a head start on your barkada and family summer getaways,” Herrera said. Never miss out on updates about our bargain deals by following AirAsia via Facebook (facebook/airasiaphilippines) and Twitter (twitter.com/airasiaph). Philippines’ AirAsia is a low cost carrier operating from Clark Philippines. It is a joint venture amongst Antonio O. Cojuangco, Michael L. Romero, Marianne Hontiveros, and AirAsia Investment Ltd. It started operations only in 2012 with two brand new Airbus A320s, operating routes from Clark to Kuala Lumpur, Hong Kong, Singapore, Taipei, Kalibo, and Davao.